Your pup is one reliable pooch! He's at the door before anyone when mail or a special delivery arrives. You've probably thought that all the barking meant that your dog was trying to protect you and his territory from some strange intruder, but that's not the case at all. The real reason your doggie is barking when the UPS carrier comes to your door is because your dog's greatest wish is to become a delivery dog. He wishes to travel to exotic locations, delivering boxes to everyone with a smile on his face and a happy bark in his voice! Well, now you can help your pooch realize that dream. This UPS Dog Costume will have your pet playing the role of delivery doggie! 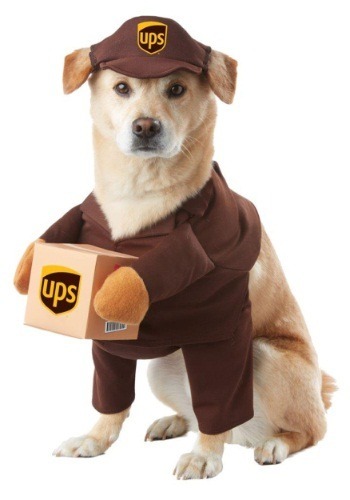 The costume is the signature brown color of the UPS uniform and even includes an adorable hat to go along with it. The attached package will make it look like he's on an important delivery and you can begin teaching him how to be the best delivery puppy.